To set up a Monte Carlo analysis, you must first define component tolerances by defining each value as an expression with one of the following functions: Gauss(), Unif() or Wc(). To prepare as schematic for a Monte Carlos analysis using component tolerances of 5% and 20% with a 3-sigma Gaussian distribution, follow these steps. 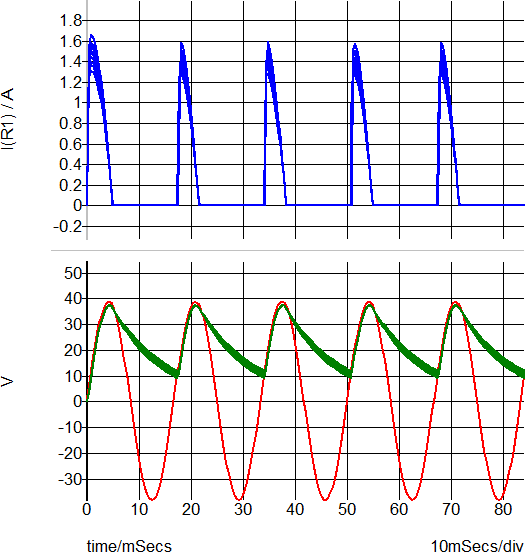 To prevent the plotting of unnecessary curves, delete the fixed probes on the V1 input and on R1. For more information on setting up tolerances, see Chapter 8 in the SIMetrix User's Manual (Help > Online Manuals > User's Manual). Usually a Monte Carlo run would use a minimum of around 30 steps since you need at least 16 steps/runs to generate histograms. For the example, below 10 steps are sufficient to demonstrate the basic concepts. 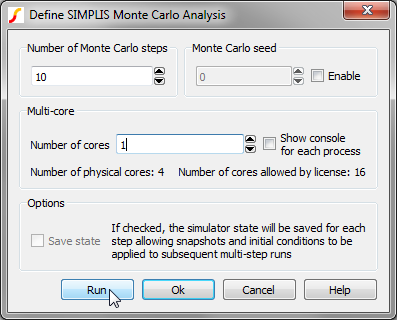 To set up the Monte Carlo analysis, follow these steps. Enter 10 in the Number of Monte Carlo steps field. Note: The dialog above is a basic HTML viewer with a log file loaded, much like a web browser. When you open the dialog, a HTML file is created and saved in the schematic's working directory. The filename is simplis_mclog.html. In addition to the HTML file, a plain text log file is also created if you want to machine parse the log file with an external program. This plain text file uses both tab and semi-colon delimiters and can be opened in a spreadsheet program. This plain text log file looks like the following. 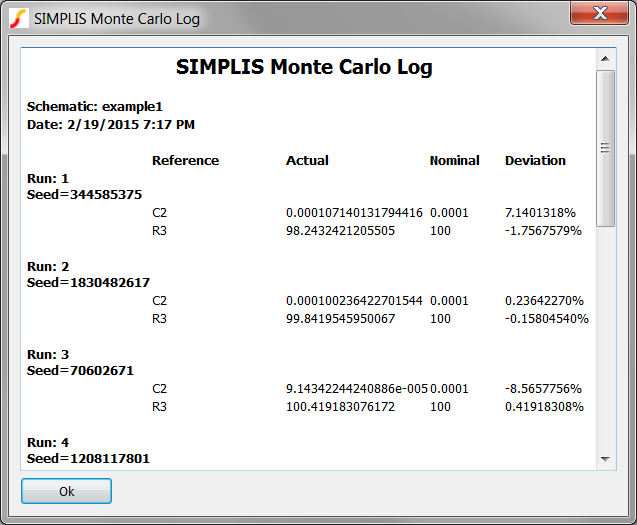 To learn more about Monte Carlo Analysis, see the Advanced SIMPLIS Training topic: 3.2 Monte-Carlo Simulations.